The question of survival is omnipresent for businesses in 2019. In recent years, employee-centered business models have emerged. Companies recognize that work improvements lead to higher quality production. Also prevalent is a focus on customers. Industries face the challenge of relating to an audience that demands more transparency. What we know is that the business landscape will continue to grow and change. 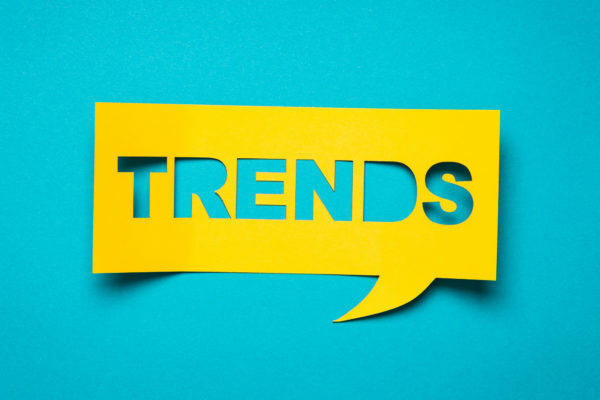 Keep reading to discover how business trends 2019 are changing the global market. The continent of Africa has seen the economy of only a few of its countries rise with the discovery of oil. Now, free trade agreements, industrialization, and technological advances are creating opportunities for others. Industries like Ethiopia’s car manufacturing will continue to grow across the continent. This will create a surge of jobs and increase the number of households with disposable income. The advent of solar electricity panels will illuminate millions of homes without power. Electrification can only lead to increased internet access, learning, and wide-spread skills acquisition. Bubble speech with cut out phrase “trends” in the paper. Automation in business software has been a growing trend for years. As companies try to do more with less, specialized software rises to the occasion. For example, before, bookkeeping information had to be entered manually into accounting software. Now the fields auto-populate when you make a sale or scan a receipt. 2019 will see this trend rise in customer communication. Customer relationship management (CRM) tools will become a business necessity in the connected age. CRMs for small business collect customer data and facilitate automated communication through email. Automation allows companies to maintain relationships based on a client’s position in the sales funnel. Better relationships lead to increased business success. A connected society demands a personalized approach to marketing and communication with customers. To this end, collecting customer data has been the key to unlock success for large and small businesses alike. This also comes with increased threats to privacy and personal information. Information security threats led Alabama and several other states to pass regulation. Legislators are looking at how companies protect and obtaining consumer information. As tech advances continue to connect us, regulators will be forced to keep up. 4.3 million Americans reported working remotely at least half the time in 2016. 3.2% seems small until you consider that this is a 114% increase from 2005. Employees who work remotely benefit from lowered stress levels and higher productivity levels. Telecommuting is most popular in the finance, technology, and design industries. The trend has created opportunities for baby boomers, working mothers, and the disabled. The number of people telecommuting is only expected to increase in coming years. The traditional form of banking is in for a major rejuvenation. Blockchain, mobile payments, and alternative lending are the new kids in class. Blockchain is a system for tracking the spending of cryptocurrency. Compare it to a banking statement. Instead of using your personal information, it uses a digital signature. A digital signature is like a username. Blockchain offers more security for the buyer. It may also be the answer to personal data security. We will see it continue to grow as the technology and use of bitcoins grow. Mobile banking will see a growth in the coming years also. Customers who prefer different payment options now have a choice of hundreds of banks all over the country. If they don’t qualify for in-person loans, there are alternative lenders online with fewer restrictions. You don’t have to be the CEO of a public corporation to feel the changes in the market. A more connected, global economy means that everyone has a chance to compete for the same employees and customers. Business trends 2019 will see a rise in banking flexibility and personal data security. Add to this flexible employment and the rise of new economies. Proper market research can keep your business ahead of the trends. Click here for common mistakes to avoid.